If you’d like free OLSAT test practice questions or would like my free G&T newsletter please email me at skipper646@gmail.com. Make sure you also check out TestingMom.com for daily Bracken test sample and practice questions! There are also fun exercises to do with the child at the end of each section to reinforce the concepts on the Bracken. The quality of the printing material is superior and on high quality paper along with high-definition color print. If the $99 price point is within your budget and you can still afford groceries for the week after shelling out the $99 then I’d highly recommend this book to parents who have children taking the Bracken. Shipping is free and Aristotle Circle has extended an offer to readers of this blog 10% off the price by using promo code NYGT at check-out! Here’s an overview of the Bracken test for those parents who aren’t familiar with it. 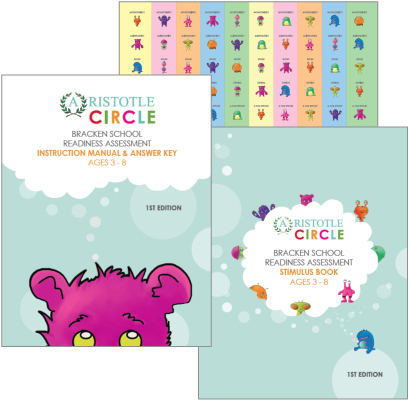 The Bracken School Readiness Assessment covers 5 subsets – colors, letters, numbers/counting, size/comparisons, shapes. Most parents think the Bracken test for New York City gifted and talented program is the “easy” portion of the G&T test for NYC gifted and talented since it covers shapes, numbers, colors, etc. I can tell you that many of these Bracken questions can be anything but easy – especially for a 4 year old taking the Bracken test usually administered by a complete stranger with no redirection of the child if they get distracted. When some parents get the Bracken test results many are shocked their child did poorly on the Bracken portion (25% of the total score) but aced the OLSAT test (75% of the score). The poor Bracken test results are usually an indication the child hasn’t been exposed to some of the concepts covered on the Bracken test for gifted and talented. I can tell you that most 4 year olds I’ve come across don’t know what these shapes: pyramid, cylinder, sphere or crescent – just to name a few. Parents, don’t forget to expose your child to the concepts on the Bracken School Readiness Assessment for NYC gifted and talented program. Getting a 99% on the Bracken will give your child some wiggle room on the OLSAT portion of the G&T test to make sure they score a 90% or above.